Are they living their last days. As feared, given its opening statements, the administrative court judge ruled in favor of the Prefectural order giving way to the slaughter of the Bargy ibexes. Helicopters have already been been seen circling over the mountain yesterday. 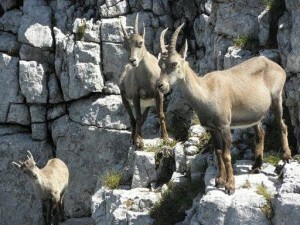 Here below is a free translation of the the PR made by the associations in defense of the Ibex. Ibex Bargy: the judge confirms the prefect expeditious solution. This morning October 21, we were informed that the Grenoble Administrative Court judge has rejected our call against the prefectural order of September 16. This order, (we will appeal against it to the State Council), authorizes the prefect of the Haute-Savoie to carry out indiscriminate slaughter of all Bargy goats , with the exception of a few dozen animals marked this spring, deemed healthy. There are about 300 goats left in the Bargy range, and 2/3 of them are perfectly healthy and must be saved. We (the associations) are not going to stop here, as we believe, with scientific experts who have extensively worked on this issue, there are other more effective methods – and much less radical for wildlife – to eradicate brucellosis. On the legal plan, our associations are immediately launching an appeal to the State Council, so as to suspend the prefectural order. It is to note that the administrative judge will drive a thorough review of the legality of that decision only after several months, this justifies the request to postpone the shots as of today. On the political front, with Nicolas Hulot, we ask Ségolène Royal (Ministry of Ecology) to intervene again and order the Prefect of Haute-Savoie not to resume the shooting and to listen to the scientific and technical arguments put forth by all the consulted scientific bodies. There is no urgency to act brutally and irreversibly: according to experts, the risk of infection of domestic livestock is “virtually zero to minimal” and to man “zero to almost zero.” In its report of July 2015, ANSES (a National Health Security Agency for Food, Environment and Labor) has shown that there is a middle way, which allows both to combat brucellosis, protecting domestic livestock and dairy industry, and preserve healthy ibex. We will not give up until a balanced solution is implemented on the Bargy massif.